U308 Spot Price Starting To Make A Significant U-turn? While the long-term uranium price sits quietly at US$44/lb., the spot price is finally showing signs of life again. Spot U3O8 was in the mid to high $30's since last summer until it fell sharply in April of this year to lows not seen in over 9-years. The spot price remained at around $28/lb. for most of this spring and summer, but has recently strengthened again to $32/lb.up around 14%. That's a nice percentage gain although we can't get too excited about a $4 per pound move in a commodity known for high price volatility. 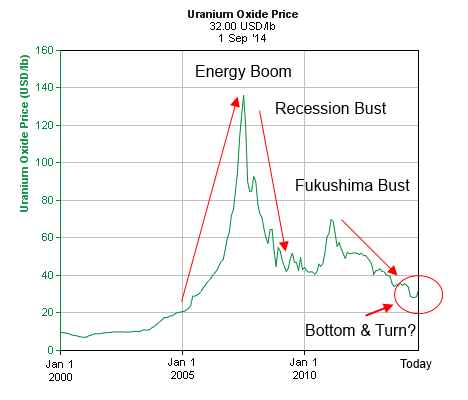 I have been saying uranium is overdue for at least a bounce after falling steadily for the past 3-years from over $70/lb. on the Fukushima nuclear accident in Japan. So is this just a bounce or the start of the major turnaround we have been waiting for? Spot U3O8 is moving higher for all the right reasons. Industry reports show that spot purchases in August were robust, with volume surging 2.7Mlbs. to 4.2Mlbs. as U.S. utilities requesting delivery were filled. Recent demand strength with diminishing supplies have driven short-term prices higher, and as of last week there were two outstanding long-term requests for 4.5Mlbs. due in August. The fact is that most miners can't produce U3O8 profitably at current prices. I have written about many major mines that have closed, less exploration for new resources, and recycled supplies that have now ended. At the same time China and many other countries are building reactors as fast as possible to meet their future energy needs. This can only lead to supply shortages and much higher uranium prices as the world's fleet of nuclear power reactors is set to double over the next 15-years. Markets often overextend in both directions and I still believe uranium is oversold. Despite strong near-term and long-term fundamentals this has lasted longer than expected as utilities have been able to sit on their hands hoping for even lower prices. However if they start to see this bounce as the turn, with U3O8's bear-market bottom now in, we might see spot and term prices move much higher. Uranium's all-time high of $137/lb. was in 2007. Back then most energy related investments were booming, with future supply risks having the biggest effect on U3O8 spot prices. A key event was the delay of (NYSE: CCJ)(TSX: CCO) Cameco Corp.'s Cigar Lake mine due to major flooding issues. The world's second largest high-grade uranium deposit, this technically challenged mine just started producing this year after 9-years of construction. The mine is still not at full production and feed processing is now behind schedule and not expected until next year. For more info search: Cigar Lake hit by another delay as Cameco suspends mining on freezing failure. As I read these recent articles I wonder how much of this huge mine's anticipated production was built into today's low spot price. Potentially making matters worse is Cameco's announcement a week ago that production continues to be suspended at the McArthur River mine and Key Lake mill operations in northern Saskatchewan due to a labour dispute. Both are vital to uranium markets as McArthur River is the world's largest high-grade uranium mine and Key Lake is the world's largest high-grade uranium mill. While not expected to affect 2014 deliveries, a prolonged strike could also have a bullish impact on U3O8 prices. Another key catalyst is Japan, the world's third largest U3O8 consumer prior to Fukushima. In addition to losing millions of pounds of demand each year, Japan's low centrifuge capacity bloated global inventories. More demand and high centrifuge capacity will result as Japan's reactors restart. Japan Times recently reported that the 30-day public comment period to restart Kyushu Electric's Sendai nuclear power plant generated approximately 17,000 comments to be included in a final safety screening report expected as early as this month. Japan's Nuclear Regulation Authority (NRA) approval is by far the major part of the licensing process which began in July 2013. Two smaller approvals and NRA verification remain which may conclude in October. Sendai (units 1 and 2) could restart and generate electricity again by year's end. Applications for 15 other reactors remain at the review stage with Takahama 3 and 4 said by the NRA to be the next most advanced. Demand growth during tight supplies is the perfect recipe for higher uranium prices. The U.S. and its 100 operating nuclear power reactors is the world's largest consumer of uranium at around 50Mlbs. per year. However U.S. uranium mines produce less than 5Mlbs. per yearless than 10% of the country's needs. With only six publicly-traded uranium-focused producers worldwide, U.S. based producers might even attract an energy security market premium if the U.S. ever decided to put sanctions on Russian uranium, or if Russia ever decided to halt uranium sales to the west. You can't hold physical uranium like other commodities because it's radioactive, and it doesn't have an active futures market. ETF's or funds like (TSX: U) Uranium Participation Corp. act like a proxy as they invest in uranium oxide in concentrates and uranium hexafluoride. The problem is that it now trades at C$5.2518% higher than its August 31 C$4.44 book value. Over the past few years it traded at around a 7% discount to NAV. For me the only way to play uranium for potential maximum leverage to higher U3O8 prices plus earnings and dividends growth is uranium mining stocks. (AMEX: URZ)(TSX: URZ) Uranerz Energy Corp. controls one of the largest land positions (~80k acres) in the prolific Powder River Basin (PRB) of Wyoming. The nations largest processing plant is in the PRB and 70% of U.S. produced uranium comes from Wyoming. URZ' vast central PRB properties are surrounded by major uranium producers such as Cameco. Uranerz has established NI 43-101 resources of around 20Mlbs. of U3O8 to mine, with most of its six primary projects plus up to 30 potential projects yet to be explored. Nichols Ranch is the company's first uranium mine, which commenced In-Situ Recovery (ISR) operations in April. "Uranerz Energy Corporation is pleased to announce that it has delivered its first drums of uranium (as U3O8) produced from its wholly-owned Nichols Ranch ISR Uranium Project in the Powder River Basin of Wyoming, U.S.A. The shipment of approximately 36,000 pounds was received at ConverDyn's Metropolis Works Facility, located in Metropolis, Illinois, for subsequent transfer to one of the Company's utility customers. Uranerz signed its first long-term uranium sales agreement in 2009 with (NYSE: EXC) Exelon Generation Company, LLC, and signed its second sales agreement with another major U.S. utility later that same year. This delivery will satisfy a portion of Uranerz' existing long-term sales contracts and the Company expects to make its next shipment of uranium later this quarter. The Nichols Ranch production facility is the newest uranium mine in North America. Commissioning of the Nichols Ranch ISR Uranium Project began on April 15, 2014 with the start of chemical addition to the circulating groundwater. The in-situ recovery process utilizes oxidized groundwater, fortified with baking soda, which is distributed through the underground uranium deposit by means of injection wells. The uranium-bearing water is recovered using production wells. Uranium is loaded on ion exchange resin at Nichols Ranch, and the resin is then transported to Cameco Resources' Smith Ranch uranium production facilities for final processing into dried and drummed uranium concentrates. As the operations at Nichols Ranch have begun to transition from commissioning to commercial production, we are continuing to observe the expected improvements in the uranium recovery parameters." Uranerz has completed its first uranium delivery, with its milestone first sale, production and revenue figures anticipated this quarter. The long-term sales agreements signed in 2009 are probably in the $50-$60/lb. range for the next 7-years, providing healthy margins based on $35/lb. operating costs. Uranerz is targeting to produce around 300k-lbs. of uranium in 2014. Most of this U3O8 will be sold under the company's premium long-term sales agreements mentioned in the news release. However Uranerz' Nichols Ranch mine is licensed for up to 2Mlbs. 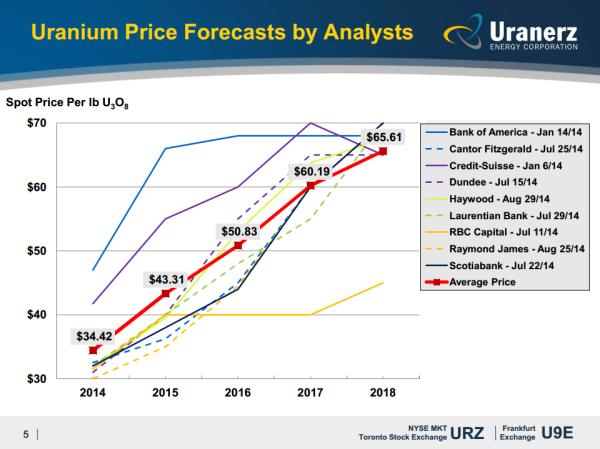 per year, and as production ramps up next year, with its nearby mining units such as Jane Dough also added in over time, most of URZ' additional production remains fully levered as uranium prices start flying higher. URZ has been trending up again over the past few weeks. At Friday's close of $1.18 URZ still trades at a 6% discount to its $12 million equity financing that closed on July 25 at $1.25 per share.